I just finished another Easter Egg for our Labyrinth Junk Lady cosplay, and thought you guys might dig this one as a craft on its own. Sure, fairies in the Labyrinth are pests, and Hoggle delights in spraying them, but I figure maybe he captured a baby one for Sarah. Or he just likes tormenting them. Whatever. 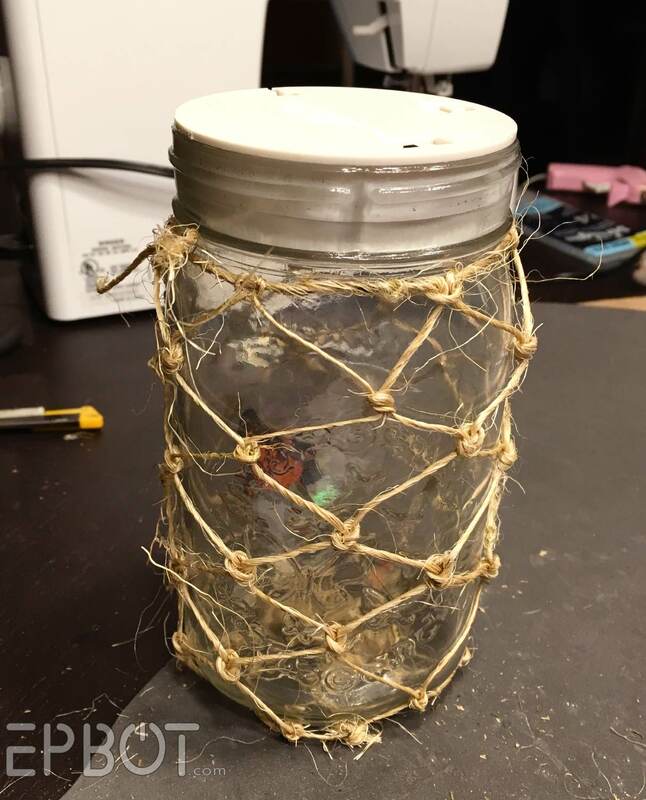 The point is, I really just wanted to make a fairy jar. Labyrinth fairy. 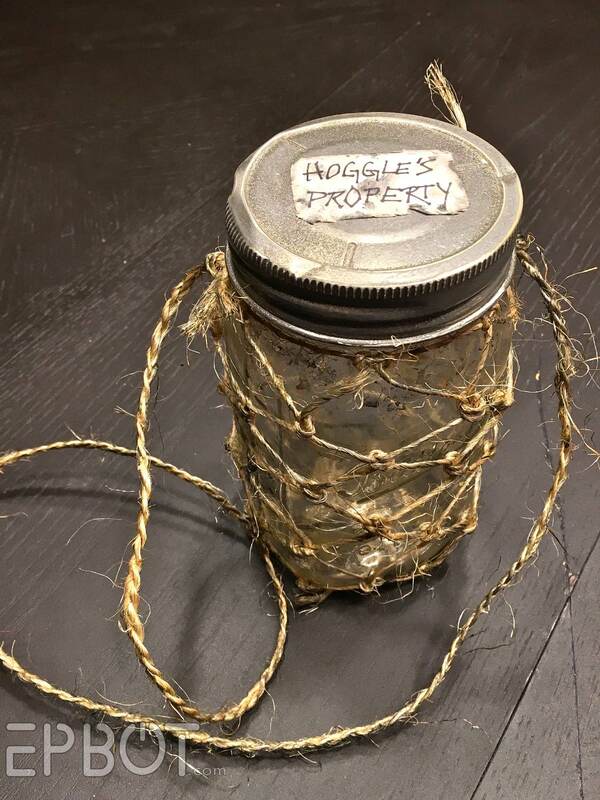 The full grown ones fit in the palm of Sarah's hand, so I figure my jar specimen is approximately baby-sized. Plus your fairy jar doesn't have to be nearly as grungy mine. The life-like motion on these things is INSANE, as you just saw in my video. And since you can only see the hair-thin wire operating it against a bright white backdrop, it really does seem to operate on magic. 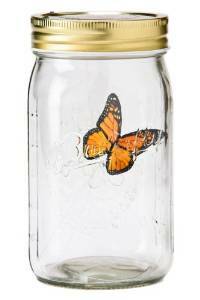 I knew from the beginning I wanted to mod one of these butterfly jars, but I balked at the $20+ price tag. So imagine my squealish delight when I found a used one on one of our MANY thrift store runs for $1.50. A BUCK FIFTY, Y'ALL. Woot woot! 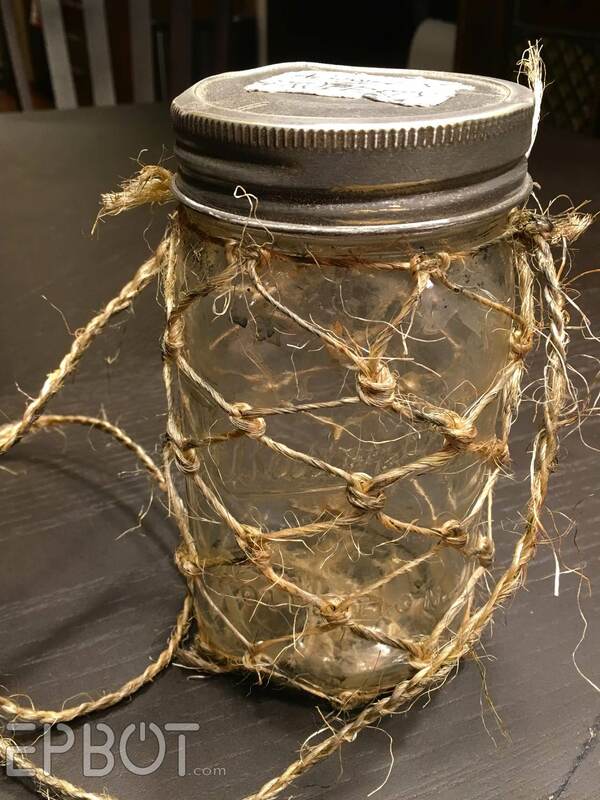 So thrifters, look closely at those mason jars from now on! Now I want to net ALL THE THINGS. I then aged both the glass and the twine with watered-down craft paint in shades of tan, brown, and black. I also used card stock to make a quick tag, doused it with watered down craft paint, ripped it up a bit, and glued it in place. 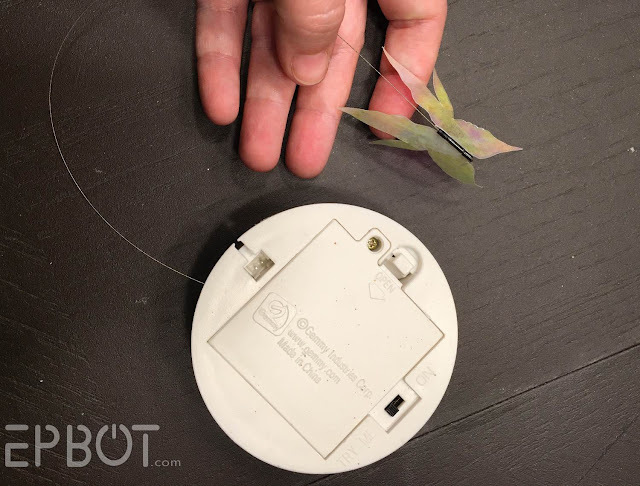 Now, to turn your butterfly into a fairy, unscrew the jar lid and pry out that plastic assembly on top. 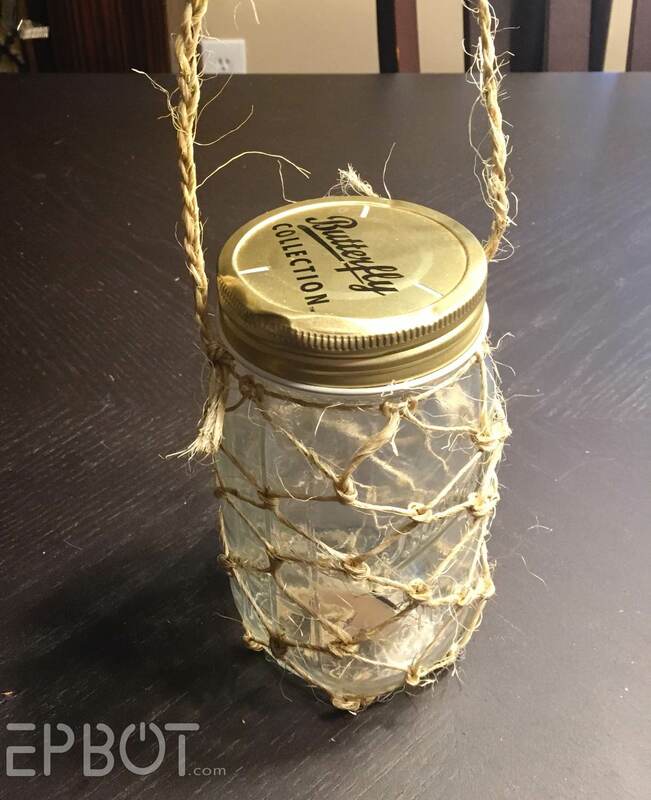 You'll find the butterfly inside is attached with a long, thin wire. From here it's a matter of peeling off the clear tape holding one of the butterfly wings in place and replacing it with your own. Do this one wing at a time, and try to replace the tape in roughly the same position on the new wing. 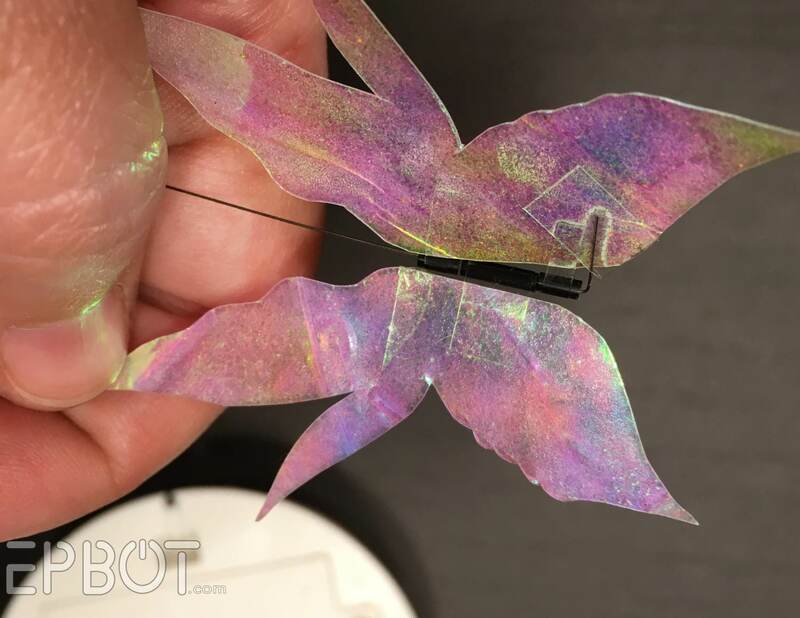 To make those new fairy wings, fold over a sheet of holographic film four times, using a quick blast of spray adhesive between each fold to hold it all in place. Those four folds will give you a film that's 16 sheets thick, which is just the right thickness: still flexible, but stiff enough to hold its shape. See the tape? That little wire point twists, which is what makes it flap around like crazy. Feel free to experiment with wing shapes for your fairy. John liked this tri-point number, but as long as it's relatively the same size as the original wings, almost anything should work. Hope this inspires some fairy fun crafts out there! Happy weekend, guys! TOO COOL. What about the fuzz from a cotton ball or q tip for the little fairy's hair? I love this more than I can even say. Brilliant! You just made my day! SO PRETTY. Now I want to have a whole shelf of fairy jars! Fantastic!!! You guys never cease to amaze me! And thank you so much for doing the wonderful tutorial for all of us! Have a wonderful time at Megacon! whaaaaaaaaaa? I hadn't seen butterfly in a jar before, so I was so much more amazed at the video before you explained. Still super impressive. So jealous! You out craft everyone I've ever known! Anyway, just for kicks: https://www.eeweb.com/electronics-forum/what-do-i-need-to-make-my-own-electronic-butterfly-in-a-jar which led me to learn about http://www.musclewires.com/Products.php which I can TOTALLY see all kinds of cool uses for! (FWIW, most animated parts of puppets use - well, depending on your puppet ideology - either a mechanism using a spring, or a mechanism using flexible medical tubing.) 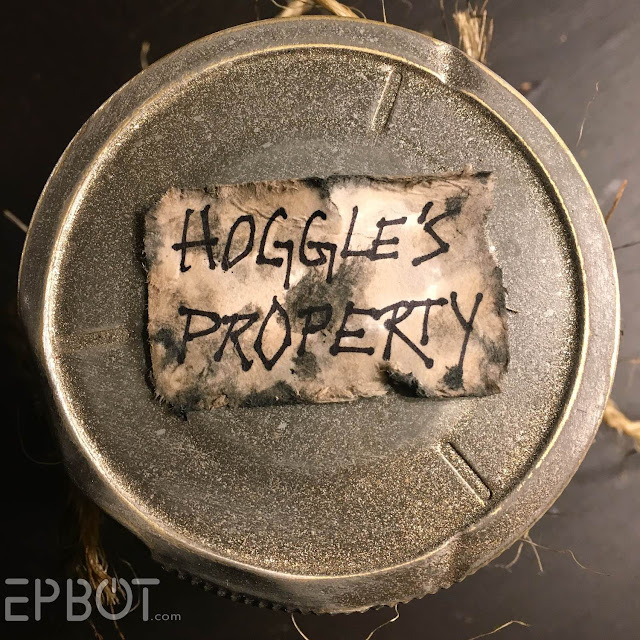 You could build the same exact mechanism as old-fashioned marionette open-shut eyeballs (or even better, up-down eyebrows) and make them electronic using this stuff! Squee! This is great--the whole costume and build. But you need to poke some holes in that lid so your fairy can breathe. one of the things i enjoy most about epot and you guys is the reminder to look at things a little differently... life is so much more interesting than i notice most of the time, and the child like wonder (compliment, i promise) which you two have, helps remind me to look around and enjoy things... also, i think the junk lady cosplay is the greatest! Jen, I DONT HAVE ROOM FOR ALL THE CRAFTS YOU MAKE ME WANT TO TRY! If you still want a wig, I wonder if you could adhere a few pieces of the really fluffy part of a feather? Not sure if they still carry them though. Everyone always asks me if it's real. I've seen them at big lots recently though I can't tell you the price. OHMYGOSH that is the COOLEST thing ever!!!! I saw your junk lady costume at Zmegacon and was blown away by it. Great work!